The most Ancient Mount Arunachala, is none other than the Lord Arunachaleshwarar Siva Himself. The story about the origin of the Hill, is a very fascinating and intriguing one. It is mentioned in the Puranas that whosoever hears this story gets absolved of sin. It so happened, that once, Lord Brahma and Lord Vishnu, literally started to have a discussion as to who is greater among them, and who is mightier among them. Who is the most Supreme? And as the discussion became heated up into an argument, that very moment, an Effulgent endless Column of Light appeared before them. A voice arose from this Light, that whosoever reaches the end first, is greater among the two. So Brahma assumed the form of a swan, and Lord Vishnu assumed the form of a boar. The form circumambulating this Light flew upwards and the wild boar circumambulating this Effulgence, went downwards digging into the earth. Both departed in their own ways searching for the end of the column of this Divine Effulgence. After travelling for a very very very long time, it suddenly dawned on the wild boar that there was no end! So the boar returned to where it had started from, whereas the swan continued its search, and on the way, it encountered a pineapple flower. It questioned the flower, “How far is the end? And the flower responded, “Oh! It is very far!” So Lord Brahma in the form of a swan continued on His journey and after a while, returned to the flower asking the flower to bear witness to the fact that He (Lord Brahma), had reached the end. So Lord Vishnu accepted defeat by acknowledging that He could not reach the end of this Effulgence. Lord Brahma proclaimed victory at the fact that he had been upto the end. Hearing this, something very marvelous happened… Lord Shiva appeared out of this column of Effulgent Light and in a rage of fury, threw His Trident at Lord Brahma, decapitating one of His Heads. Since Lord Brahma was known to be the Creator, He had four heads facing in all the four directions, north, south, east and west. So, Lord Shiva then cursed Lord Brahma for speaking lies. And since He was a ‘Deva,’ uttering lies would not befit Him. Beings of such Stature, it would bring shame and compel faithlessness upon those who believed in the Devas. Lord Brahma was then cursed by Lord Shiva, that, for uttering lies, He would not be worshipped like all other Devas and the pineapple flower too, was cursed for bearing a false witness to this entire Divine Revelation and this Cosmic Event. It was cursed so that its flower and fruits would not be used for any worship. Lord Brahma immediately and humbly, accepting this fault, apologized to Lord Shiva and requested Him, prayed to Him, to take a form so that His devotees and worshippers could pray to Him and worship Him. Lord Shiva consented to this prayer of Lord Brahma and took the form of what we know today as the Holy Mount Arunachala. ‘Aruna’ meaning ‘Light’ and ‘Achala’ meaning ‘Immovable’, Arunachala Shiva, the Eternally Present Effulgence, is none other than Lord Arunachaleshwarar Siva Himself. The Effulgence, that always was, is and will be. Hence, Lord Shiva revealed yet another Cosmic Form as ‘Lord Arunachaleshwarar’ to His beloved Ones. This is the story of the Origin of the Holy Mount Arunachala. Pilgrims throng here, every Full Moon, circumambulating the 14km path around the Hill, praying and worshipping the Lord Arunachaleshwarar Himself, who is also known as the wish fulfilling Mountain in the Puranas, and is known as the Curer of all maladies, the Healer of all sicknesses and diseases, the Granter of Boons and the Protector, the Guide of wavered, wandered souls. Lord Almighty, the Supreme Lord and The Supreme Self, Arunachala Shiva. In the Krita Yuga, the Mount assumes a fiery form. In the Treta Yuga, assumes a ruby colour form, in the Dwapar Yuga, it assumes a golden form and in the Kali Yuga, assumes a rocky form. Even the Devas have had their sins pardoned by worshipping Lord Arunachala. It is the Benediction and the Blessing of The Lord upon His devotees, that keeps them safe and in His Grace. In whatsoever form and in whatsoever, Lord Arunachala is praised, prayed to or worshipped. He is the Ever Present Effulgence, who grants us His Blessing and protects us from all kinds of misfortune. It is said that those who, with veneration in their hearts, circumambulate the Hill, achieve a status that is higher than those of Gods, and attain to Liberation with The Lord Arunachaleshwarar Shiva Himself. Such is the Grace and such is the Benediction. Every year, during the Kartikeya month, a flame is lit on top of The Hill that signifies the announcement of a new Creation where the old is transformed into the new by the Benediction of The Lord Himself. Glory to the Lord! Om Arunachaleshwarar Shiva! "A Divine Man will come and show us who we are. There is a story told by Ramakrishna Paramhamsa: A pregnant lioness once pounced on a gang of sheep passing through a forest. In the speed with which it attacked, it gave birth to a cub and then died. The cub lived in the midst of the sheep without knowing who it was, eating grass and bleating like sheep. One day, a lion came and saw this. It got the cub separated from the sheep and showed it, its reflection in the water. The cub came to know that it belonged to the race of lions and not sheep. From that time onwards, it started living like a lion. Similarly, we are living in the midst of many varieties of people in this world. My Father will show us, at the appropriate time, the purpose for which we have come into this world and what our work is. The only thing is that we must have complete and unshakeable faith in our Father at all times. The rest, My Father will take care." 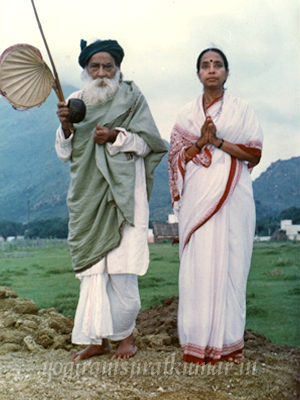 There are a few interesting stories about Yogi Ramsuratkumar, especially, about the sharp manner in which He noticed and watched over His devotees and brought to their attention, the particular manner in which He wanted them to do certain things. He would want certain things to be done in specific ways, unhindered by any mental conjunctions. A few of these, were brought into limelight by some of His earlier western devotees. Hence, indicating to us, that the Beggar, is nothing but Pure Consciousness and Awareness. There was also one more interesting story during the last days of Bhagawan. It was at the time when the doctors were working round the clock for Him and one of the doctors remarked that Bhagawan is unconscious. At that very moment, Ma Devaki retorted, “Bhagawan is not unconscious. Bhagawan is Pure Consciousness!” To prove her point, she called one of the swami’s who Bhagawan was very fond of, into the room where Bhagawan was laying down. Even in that worn out state induced due to the medications, He simply raised His hands and blessed the swami. Thus knowing Him was just not knowing Him as a Form alone but knowing Him as the Supreme Consciousness.